Happy Easter, y’all! 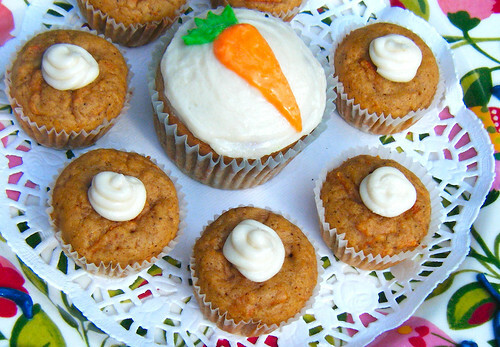 Here in the Healthy Indulgences household, we’re serving up my Sugar-Free Carrot Cake with our holiday dinner. 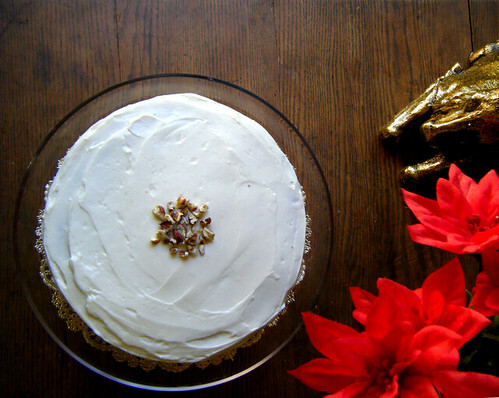 Here’s my updated version of the old Sugar-Free Healthy Indulgences Carrot Cake (check out the photos! Pretty big difference between now and 4 years ago, huh? :D), with a couple of tweaks to make it even more delicious. It’s still gluten-free, sugar-free, and diabetic-friendly, at just 8 carbs per piece! It can also be made nut-free and dairy-free with a couple of modifications (see below!). On the advent of Easter, it’s the perfect time for a new beginning. I’ve been baking on and off since January, sharing my Chocolate Cake with a Secret with friends at the local hospital and doctor’s offices. In the midst of pursuing a career in the health professions, I’ve encountered many diabetic patients who are looking to manage their blood sugar while still enjoying tasty treats. These personal encounters, in additional to emails from readers, have been the best inspiration for me to get back to making sugar-free treats! Wanna know what I’ve learned from making the the beloved black bean chocolate cake hundreds of times over the course of five years? Here are some tips and tricks to make it even more scrumptious! Why have I made carrot cake over ten times in the past three days? 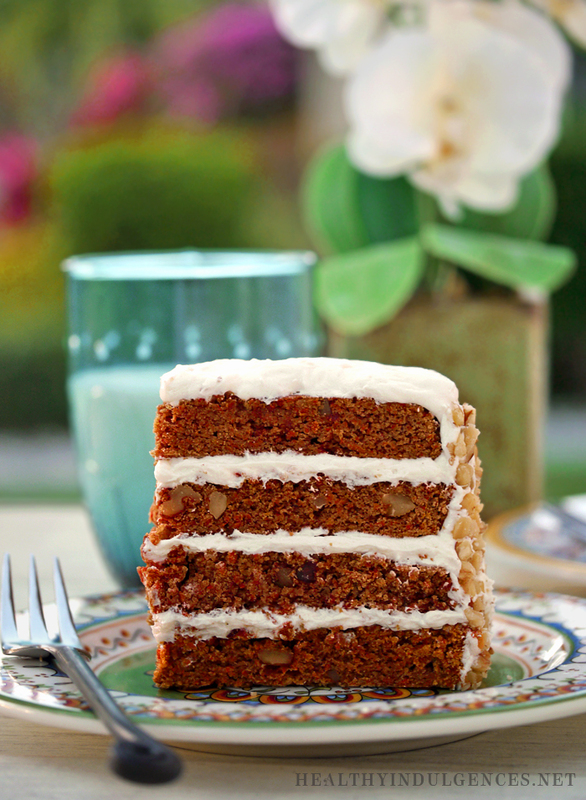 To come up with a Healthy Carrot Cake that’s low in carbohydrates and gluten-free for you! This fragrant and flavorful cake is also dairy-free and nut-free, if you omit the classic add in of chopped walnuts. 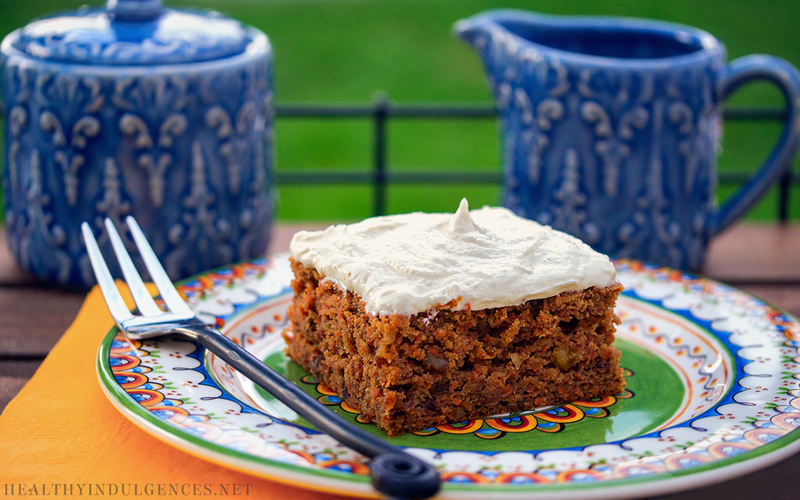 I promise you won’t miss the raisins in this nourishing carrot cake that’s not just healthy “because it has vegetables in it!” 😉 The other bad stuff–those culprits named Sugar and Flour–are conspicuously left out of this recipe. All of that grating was totally worth it. There is a teaspoon of blackstrap molasses–which is technically a sugar–in this recipe. It’s a thick, dark iron-rich syrup made from the sugarcane plant. This molasses is potent stuff, and contributes a rich flavor and coloring to the cake. You can leave molasses out to be completely sugar-free, but I think it’s worth the 4 grams of carbs. 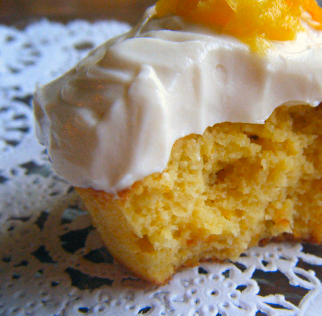 You can bake the cake into a traditional rectangular loaf, or snack-sized mini muffins. Get creative and have fun with your sugar-free frosting! It pipes well, using a zip top bag with the corner snipped off. A bit of food coloring can transform your homemade low carb treats into festive, eye-catching confections worthy of special occasions. Check the food coloring label for hidden sugar before you buy. I made the mistake of not checking the label of the Wilton gel coloring I used here, and saw it contained corn syrup, much to my dismay! That pesky Sugar manages to sneak in everywhere, doesn’t it? McCormick food colors, found in most grocery stores, are sugar-free. I’ve tried a couple of organic dyes, and unfortunately neither of them yielded satisfactory results. You need so little coloring for an entire batch of frosting that I’m not too worried about the health effects. If you have any recommendations for natural food dye, let us know in the comments, please. Healthy Cake with a Secret, Part 2- Gluten-Free Low Carb Yellow Cake! Since posting my chocolate cake made with black beans last month, I’ve received quite a few requests for a vanilla version of this incredibly moist, easy recipe. You ask, I deliver! These gluten-free sugar-free low carb (grain-free!) 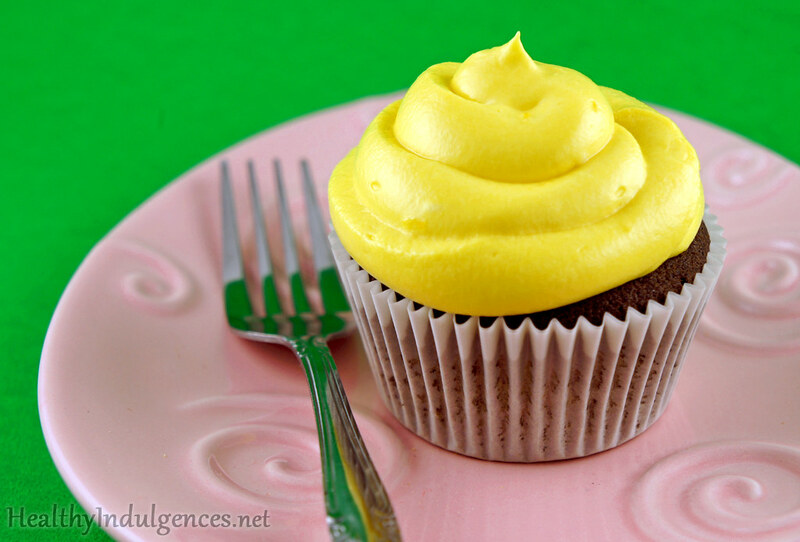 yellow cupcakes are made with coconut flour in place of the cocoa powder, and white beans instead of black beans. Cocoa powder and coconut flour seem to work interchangeably! It’s a pretty cool discovery that I hope y’all can make use of in your own gluten-free low carb baking pursuits. And because someone will ask: These cupcakes do not taste like beans or coconut! Just butter and vanilla and moist yumminess. Using beans and coconut flour in place of almond flour is budget-friendly, so you can experiment with this recipe by adding cinnamon, nuts, sugar-free chocolate chunks, different extracts… have fun! Chocolate cake made without flour, sugar, or dairy. Low carb and gluten-free, of course. Cake made out of a surprise ingredient, one that will make you wrinkle you’re nose upon hearing it. This cake is good. So good, in fact, that I had to have a mug of stevia-sweetened pomegranate tea and go to bed, so I’d stop shaving off “test” slices. There’s still too much chocolate hanging around here, so today I’m giving away a luxurious Godiva 85% cacao content chocolate bar. Leave a comment and win yourself a bar of fine chocolate! Don’t forget to look at the past giveaways for erythritol and xylitol and the Lindt and Green & Black’s Chocolate packages! 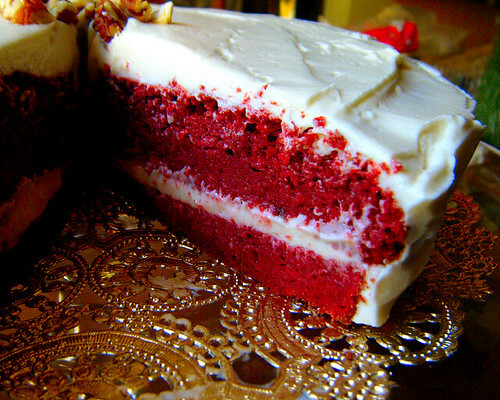 Red Velvet Cake! So glamorous. So decadent. So perfect for the holiday season! This cake is all about being over the top. Even the healthful version seems excessive in a way, using 9 eggs, a whole pound of cream cheese, and half the bottle of red food coloring. Yes, food coloring is a shady ingredient. If, however, you are following a whole foods all natural diet 99% of the time, I doubt a little slice of sugar-free, gluten-free, low carb red velvet cake on special occasions is going to destroy all of your good efforts. A little artificial coloring does not come close to doing the damage done by the “real thing,” made with flour and sugar, packing over 60 grams of carbs per slice. Kick up your heels and have some nourishing cake! Coconut flour makes the most rich, heavy and indulgent cake you have ever tasted. The nine eggs in this cake do not impart an eggy flavor at all since the coconut flour is defatted and high in fiber, therefore sucking up all of the moisture. I just picked up a bag of Bob’s Red Mill coconut flour at the local mom n’ pop health food store, but you can order it online, too. Coconut flour also does NOT taste like coconuts in this recipe, so fear not if you don’t favor that distinct tropical flavor. I split one 9 inch round layer cake into two layers since I didn’t want to invest 18 eggs in a cake that may or may not have worked well. It turned out beautifully, with a heavy, moist texture and a hint of buttermilk flavor. 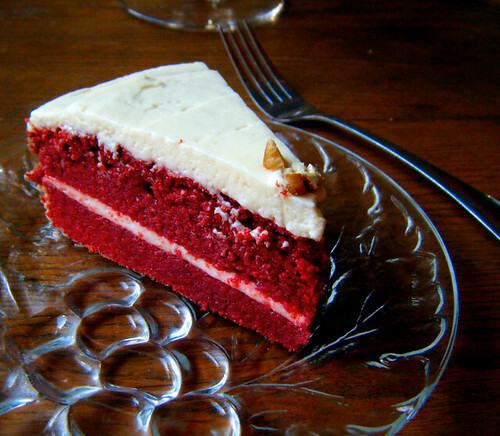 Red velvet cake has never been a chocolate cake in my memory. Granted, I have only tasted one kind, coming from a local restaurant out by the beach. If you prefer a more chocolaty cake, try adding some more cocoa powder and a couple of tablespoons of water. Set out butter and eggs to bring to room temperature. Alternatively, microwave butter for 8-10 seconds and dunk eggs in warm tap water for 15 minutes. Prep 9 inch cake pan by greasing with nonhydrogenated shortening and dusting with extra cocoa powder. Tap pan on all sides to distribute cocoa powder in an even layer. Whisk together eggs in a bowl until a bit foamy, and add vanilla extract to eggs. In another bowl, sift coconut flour and stir in sea salt and cocoa powder. 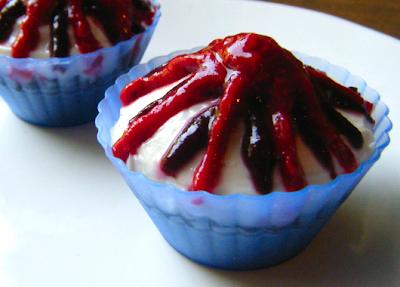 Mix together yogurt and red food coloring in a third bowl. In the largest bowl, cream butter for about 30 seconds to make it fluffy. Add erythritol in a steady stream and cream together for 2-3 minutes, or until light, fluffy, and close to the color of cream cheese. Scrape down the sides of the bowl occasionally. Slowly stream in beaten eggs, beating continuously. Don’t worry if the batter curdles. Once eggs are added, add dry and wet ingredients alternately until everything has been added but the baking powder. Mix in baking powder and scrape batter into prepared pan. Bake for 40-45 minutes in the center of the middle oven rack, or until batter is completely set and springs back. Cover top with foil and bake for longer if center is not set. Remove cake from oven and let cool for 10 minutes. Invert pan onto a cookie sheet and let cake cool completely. Slice into two layers with a serrated knife, if desired. Transfer bottom cake layer to a serving dish lined with strips of wax paper hanging off the edges. Frost cake, laying over a thin crumb coat first. Then pile on the frosting spread outward from the center of the layer. Add top layer to cake and cover completely with frosting. Store and serve at room temperature. Refrigerate after 24 hours. Cake is best tasting after warming up if it has been kept in the refrigerator. Bring cream cheese to room temperature. Beat until smooth and creamy, then add powdered erythritol and beat for about 2 minutes, or until erythritol is dissolved and the mixture does not feel gritty to the touch. Beat in butter just until smooth and incorporated. I was in a celebratory kind of mood after class today, so I whipped up something indulgent for Independence Day! It’s funny how much your taste buds change after giving up processed food. After taste-testing the fruit puree for this dish, I had to gulp down my sparkling water because of the sweet taste coating my tongue. Even natural sugars are sometimes too intense for this steak salad lovin’ palate. Methinks this is a good thing, if considerably less exciting in how it limits my exploration of the bounty that processed food companies have to offer. No cute snacks to nosh on, exempting what I cook up myself, which basically entails cheese sticks and zucchini slices with salsa. Too lazy to put effort into snack food. It’s hard enough finding time to makeover the good stuff, the piece de resistance of the meal, the apex of the dining experience… dessert! Bring these festive sugar- and gluten-free chocolate cupcakes to your fourth of July picnic, and be good to your friends and family. Or just save yourself the expense (Let’s be real–the weird natural ingredients add up!) and partake in one of these rich, dark chocolate treats before you’re surrounded by Ruffle chips, baked beans, and American flag sheet cake. One you’ve had your sweet fix, you can thoroughly enjoy your bunless burger and first and foremost, the good company. That’s what living well is all about, huh? It’s not having to worry about feeling uncomfortable from what simply fuels our bodies. Witness explosions of tangy berry goodness. Soften butter and cream cheese in the microwave in 10 second intervals. Cream butter and cream cheese along with sweeteners until light and fluffy. Add vanilla and beat to incorporate. Add eggs one at a time, beating continuously. Stir together nut flour, baking powder, sea salt, gum, and cocoa powder. Add dry ingredients to wet ingredients in 2 steps, incorporating thoroughly after each time. Finally, beat in melted chocolate (use microwave and 15 second intervals). Grease muffin tins or silicone cups with non-hydrogenated palm oil shortening or butter. Mound batter just up to the tops of the tins, because it will rise and settle back down to the original level. Bake for 20 minutes, and remove cupcakes from the pan in their liners as soon as they are cool enough to handle. Let cupcakes cool individually on a wire rack for 20 minutes and store in an airtight container just as the cupcakes are lukewarm to the touch. You want to keep them moist, as erythritol doesn’t hold water in the baked good like sugar does. 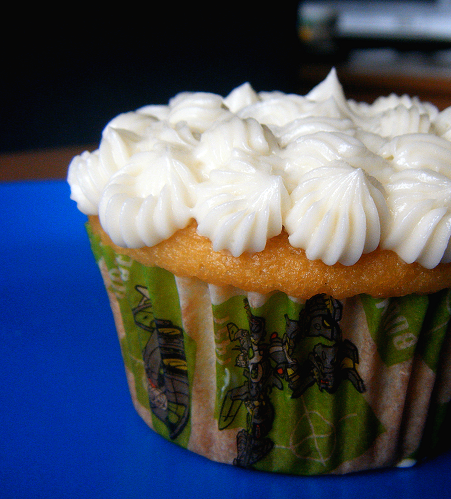 If you refrigerate the cupcakes, warm ’em up in the microwave for 10 seconds or so to get them soft again. Best consumed fresh, like anything made with all natural ingredients! ~I used pecan meal because it’s more reasonably priced, but almond meal or any other finely ground nut would work just as well. ~Use Hershey’s Special Dark cocoa to give your cupcakes that super chocolatey taste you remember from when you were a kid! ~Use 1/2 teaspoon stevia if you want them to be as sweet as traditional chocolate cupcakes. I don’t like anything that sweet any more and use 1/4 teaspoon stevia. ~Remember to look for SUGAR-FREE vanilla extract! Many products have added sugar. 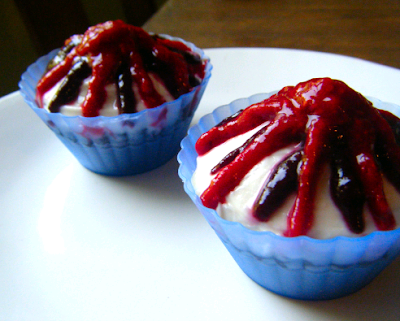 I used my Healthy Cream Cheese Frosting recipe with pure raspberry and blueberry puree. You might add some organic blue food coloring to the blueberry puree to make the color scheme truly patriotic! If you have extra puree, save it to flavor some Almost Instant Ice Cream or sweeten your morning cup of Fage yogurt. Microwave berries until soft and heated through. Blend until liquified. Add a pinch of veggie gum and stir well. Let puree rest for a few minutes to let it thicken. Spoon into a ziptop bag and snip a tiny piece off one of the corners. Pipe puree onto cupcakes. First things first: I am still working on the perfect sugar-free gluten-free chocolate chip cookie recipe. I tested a fourth batch today, but it was a bit crumbly. The flavor is spot on, though. They’ve come a long way from the hockey pucks I was making when I first started this journey a year ago. Re-creating processed foods out of all natural ingredients takes some trial and error, but it is so worth it when you get it right. For me, anyway. Sticking to a whole foods plan can get monotonous if you don’t mix things up! Interestingly enough, I eat pretty much the same thing every day except when a specific craving hits me. I think we all have a routine that we stick to, food-wise. My biology professor said we do 99% of our actions without thinking. That other one percent of the time I spend in my kitchen, with a full sink of dirty dishes as evidence! Do you remember creamsicles? They’re still around, and they even make ’em sugar-free for us health-conscious folk. Unfortunately, the pre-packaged treats are laden with sugar alcohols (the scary kind with unpleasant side effects) and artificial sweeteners, so I stick to one mini creamsicle a couple times a week. They make up the only Splenda intake in my diet, so I think my brain is safe from whatever as yet unknown side effects the sucralose molecule is inflicting on us. We are all human guinea pigs with this stuff! Back to creamsicles. The pairing of vanilla and orange is so fragrant and complementary, with the tang of the citrus balancing out the cloying sweetness that vanilla can impart. 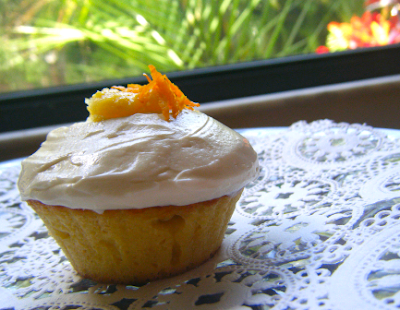 These moist, dense cupcakes showcase the full spectrum of the fruit’s bright flavor, containing one whole orange pureed in the batter. The health benefits of oranges are concentrated in the peel, which contain prebiotic oligosaccharides which promote intestinal health. With 13 grams effective carbs per orange, you can eat 1/2 at a time as a healthy snack. Furthermore, the flavonoids have been shown to lower high blood pressure and cholesterol. Psh, like you need more reasons to try these cupcakes. Top the cream cheese frosting with fruit puree to imitate the old-fashioned ice cream bar, or just drop a dollop on top with some zest. Wash oranges well and boil for 20 minutes in a microwave safe dish with a cover until fork tender. Wait until oranges are cooled, then slice them (but do NOT peel them) into sections and remove seeds. Puree in food processor until smooth. Measure out 1 and 1/4 cups of the puree and reserve the rest for a glaze to go with the cream cheese icing. Beat eggs and sugar substitute until batter is thick and golden. Beat in vanilla extract. Stir in fruit puree, almond meal, baking powder, and sea salt. Pour into buttered silicone muffin cups, paper tins (filled at least 3/4 way full), or a bundt pan and bake for 40 minutes or until slightly browned. Do NOT overbake. Test with a toothpick for doneness. Place in tupperware container with a lid when the cupcakes are lukewarm to the touch. ~2.5 grams net carbs per cupcake! Stir lemon juice into orange puree until soupy. Add sweeteners to taste. 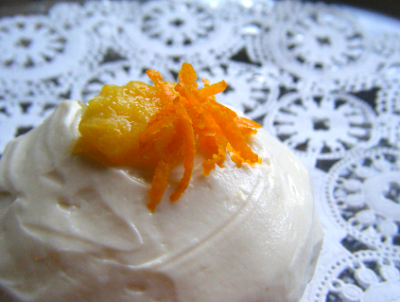 Spread or drizzle on top of cream cheese icing. Bring butter to room temperature by leaving out on the counter for 20 minutes or nuking for 10 seconds. 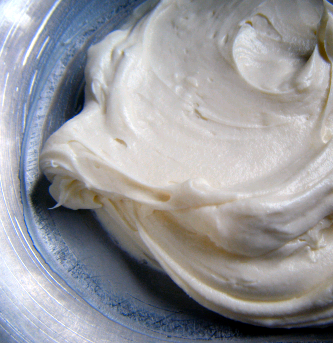 Beat butter, cream cheese, and vanilla extract together until Smooth. Add sweeteners to taste. 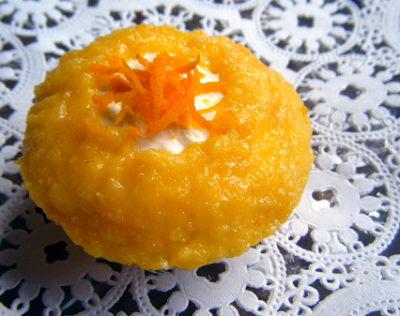 Spread on cooled cupcakes or cover with plastic wrap and refrigerate for later use. Just bring to room temperature and beat until creamy before use. My batch made fresh this morning is mysteriously almost gone! If you have benefited from the information posted here, please consider donating $10, $20, or $50 to help cover site costs. Your support keeps this site running on a student budget! Get your complete guide to sugar-free, gluten-free baking for $5.99. Homemade Low Carb Gluten-free Wraps: You can do it too! 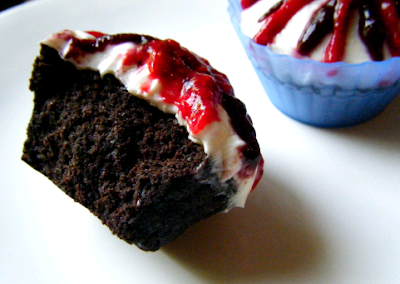 Healthy Instant Chocolate Cake (aka 1 Minute Microwave Cake) and a GIVEAWAY! All recipes, titles, stories, and photos on this website are the property of Lauren Benning. Feel free to share photos and link to the recipes on this website. Please do not publish the original recipe without requesting permission first. If you modify any of the recipes you see here, kindly include a link back to the original post. © 2008-2014 Healthy Indulgences. All Rights Reserved. Design by bluchic themes. Development by David Tinnes.